We’d like to introduce you to Ghost Recon Predator. In the game, you’ll lead your elite squad on the hunt for terrorists in the jungles of Sri Lanka. Deep behind enemy lines, your mission is to take out the insurgents before the situation gets out of hand. You’ll encounter the enemy on his own ground; he knows the terrain better, has more allies, knows where to hide and where to attack. Surprise is on his side – he can be anywhere, he can be anyone. In a crowded street, you’ll first have to make the distinction between friend and foe, and the only way to fulfill your mission is with the help of your technology and training. For Ghost Recon Predator, our goal was to create a game that would deliver some of the classic Ghost Recon action moments from this fantastic franchise. We really wanted to make the player feel like an elite soldier surrounded by highly-trained teammates and include as many cool features as we could. Some of the features we’re most excited about include character swapping, third-person cover and of course tons of customizable weapons and high tech gadgets, such as the RC drone. All of this will be necessary to overcome the challenges that the ghosts will face by trying to unveil the truth to prevent a war of massive scale. Last but not least we are also providing a multiplayer co-op experience with up to three players! Sounds interesting, and it sounds like this is a PSP exclusive? But will it have cross game chat? At least it’s not first person camera. I like that camera angle in the screenshots. It’s coming out in November. Specific date still TBC. Looks like fun. :-D More PSP madness and news lately! That’s exciting. This looks like a great addition to the PSP’s lineup! I WISH someone would make a true modern military FPS for the PSP, though! I’ve been playing Coded Arms lately and it’s a FANTASTIC SciFi FPS, it controls great in spite of the single analog stick, it proved good FPSs are doable on the PSP from the get go… Fast forward 5 years and it seems every other platform, even the weak DS, has a glut of modern military FPSs and the PSP DOESN’T HAVE EVEN ONE. It’s frustrating that a Platform as good as the PSP doesn’t even have a single title in the most popular genre in video gaming. Everything is third person or WWII. What the heck? 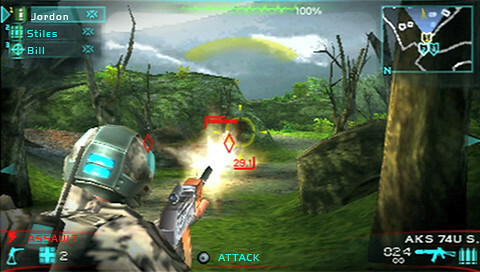 The psp still has potential, but even great games like Peace Walker, suffer from control issues that can limit the enjoyment of the game. A good control scheme for psp shooters is a must. So the PSP ISN’T getting Ghost Recon: Future Soldier and is getting THIS instead? this looks good tho. online infastructure and Ad Hoc i hope? Ad Hoc only. The Multiplayer co-op mode allows up to 3 players. STILL NEED MEDIA GO SOFTWARE UPDATE TO MOVE UMD GAMES TO PSP MEMORY STICK. PLUG. PLAY. PSPGO. This looks intresting I might get it if I like the control scheme. I really liked the controls for logans shadow on the psp so if that’s a similar scheme, I might get it. Hm. Maybe. It looks good. What about you Nate? Do you think I should get it? I was lucky enough to try it and it’s a lot of fun! Definitely check it out when it will be available. developed from the ground up for the psp? and also, any chance of infrastructure multiplayer online play? Yes, this title is exclusive to the PSP. Ad Hoc only for the multiplayer. Multiplayer co-op infrastructure or ad-hoc? thanks Ubisoft for a true title designed for the portable itself instead of making port from the ps3, 360 or anything. well ad hoc is good because u can use ad hoc party via ps3 to play with your friends, thanks, will be getting this. I’m kinda curious as to how this’ll play on PSP. Any notes taken on giving the player handicaps for aiming? Looks the same as SOCOM: Navy Seals. My money is on ad-hoc only (as usual). What about replayability?? Any istant action missions a la SOCOM FTB games. I love GRAW 2 for PSP a lot, but the fact that there was little replayability options hurt that game a lot IMO. I wish it had infrastructure, still looks cool. is it ad-hoc party friendly? Will it contain stuff from the PS3 version? it would be awesome if it was ghost recon vs predator. lol. would be interesting none the less. looks good thus far so i’ll keep an eye on this. Wow… That’s great news, the last Ghost Recon AW2 on PSP was awesome and one of the PSP titles I still play very often, it will be cool to move on to another new Ghost Recon. The controls for the last one was great for a PSP shooter, I hope that stays the same. It sure will be a day one buy for me. Adhoc cooop oonly? or adhoc versus also? Looks awesome! Another November release date…. SWEET! Looks awesome! Thumbs up for Ubisoft specially because the storyline is tuned with what happend in real life in Sri Lanka last year as the SL armed forces annhilated the insurgents from the country after 30yrs! The game play looks FUN!!! I hope it comes on to the playstation 3 somehow!!! The visuals look pretty cool on psp tho! Please change the country UBISOFT!!! Can we expect a demo anytime soon?